China has become the choice destination for Berhe, the global hub of the bamboo trade, to acquire modern manufacturing equipment. This has allowed him to scale up from producing toothpicks to flooring and curtains. China is also beginning to invest in Ethiopia. With a brand new office established, Addis-Ababa is now a host to the International Network for Bamboo and Rattan (INBAR). Ethiopia has the resource needed to work together with other markets. China has the technology, the capital, and the international market, so if Ethiopia can produce high quality products for international and domestic markets it would potentially be a major boost for the wider economy. It is estimated that the global market for bamboo is worth $60 billion and rising, a lucrative prospect for Ethiopian businesses. This is the fastest-growing plant in the world, capable of growing almost a meter a day, so stocks can be rapidly regenerated. 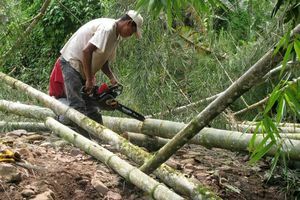 The bamboo trade will also benefit from its greater sustainability than rival materials such as timber. The plant is extremely versatile. It can be used for everything from furniture to paper. Ethiopian domestic companies could easily be the early adopters of a major new industry.